Foreign shores have a special fascination for the city’s well-heeled residents. They love to travel there, and ENJOY! NO gifts! No planning! Just a wish! And foreign lands beckon the city folks. Rupinder Singh Bedi, a businessman, has been off to foreign lands, many times with his family. THE famous lemonade brand Amin Chand may not find a place in the market if the government decides to "uproot" the 90-year-old business establishments in Chowk Ghanta Ghar Market outside the Golden Temple complex. Can Amritsar become the business hub? The Amar Shaheed Yaadgar Committee organised the 10th memorial festival at Guru Nanak Auditorium here. During the festival, city schools presented plays depicting the sacrifices made by freedom fighters during the Independence struggle. THE Synchronise Sports Club, Amritsar, organised Inter-School Hoopla Tournament at Pioneer School, Fatehgarh Churian Road, recently. More than 200 players from 15 schools competed in the tournament. THE Apple Festival held last week was a delight for the city's gourmets. The aim of the festival was to promote Washington apples in the preparation of the Indian cuisines. NO gifts! No planning! Just a wish! And foreign lands beckon the city folks. Rupinder Singh Bedi, a businessman, has been off to foreign lands, many times with his family. Except for spending on tickets, it is robust Punjabi hospitality which makes his stay in foreign lands enjoyable. The Punjabi hospitality has helped him fulfil his desire to enjoy exotic locales, eat Punjabi food in the heart of Paris and guzzle, to his heart’s content, while enjoying the best of stay. Interestingly, all his friends are restaurateurs and food has never posed a problem for him while travelling abroad. The language barrier, too, has been overcome in European countries. Besides Russia, England, Dubai and Singapore, Rupinder with his wife Jagdish Kaur, daughter Anu and son Tanvir, takes holidays to new countries every year. It is Amsterdam in Holland that fascinates him. The place allows speeding up to 200 miles an hour on high-speed bikes equipped to carry pets — dogs — fully secured with seatbelts and racing goggles. “All one needs is sanction and stamping to drive abroad from our local DTO,” he says. Rupinder, who has been holidaying abroad for the past one decade, hardly remembers staying in any hotel abroad. “All I do for my friends is to extend the grand hospitality to them on their annual visits to India,” he says. For Sanjay Galhotra, owner of MK Hotel and Caterers, the attraction of holidaying abroad has not diminished in the past 12 years. Earlier, the family (Sanjay’s wife Shelly, three children and parents), shirked from the prospect of touching foreign shores. They found Kashmir a safer bet. But no longer! “Travelling light” is a familiar refrain for these travel buffs. “Importance of time and planning are vital lessons one learns abroad, while children get to do adventure sports — scuba diving, water sports, besides forming links with historical sites and events they may have read about,” says Sanjay. “Desert safari in Dubai” has been their greatest experience, where candlelit dinner complements the Arabic song, music and dance. “William Shakespeare’s house in Stanford, England, was a truly an awesome experience,” says Shelly. Bid for hotels on Internet, carry medication and health insurance cards are some tips for the first-time travellers, she adds. All countries provide a rich educational experience, says Ms Manveen Sandhu, Principal of the Springdale Educational Institutes. “One needs to be knowledgeable about one’s country. Everywhere our sari and salwar suit evoke admiration.” Manveen claims that the travelling bug bit her initially due to her husband Dr Shavinder Singh’s seminars and conferences abroad. Later, the family started holidaying at Ireland, England, Canada and Australia. The strongest contenders for the title of the “high-flier couple” seem to be Ravinder Pal Singh Chattha and his wife Chand N. Chattha, both exporters. In their late 50s, the couple has stayed abroad for many years. They take a minimum of two annual holidays abroad, besides short ones off and on. 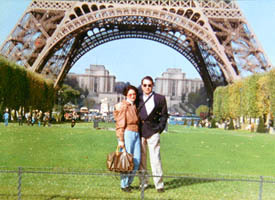 Having familiarised themselves with exotic countries and locations in Brazil, Egypt, Argentina, Greece, Europe, Turkey, Australia, besides the trio of America-Canada-UK and numerous cruises later, they are looking for an “Alaskan Cruise” and flowery Hawaii this time to celebrate 35 years of their togetherness. Having two daughters settled in the US has an advantage, as the entire family joins in celebrations and holidays in one country. Keen on privacy, and enjoying their own space, the couple has always preferred the hospitality of the top order in the first class hotels abroad. “I always want to take Chand with me everywhere,” says the doting husband about his wife, who had been Ms Teenage India Princess in 1968, besides being Ms Dalhousie and Ms Chandigarh. “Her love for life, fun and her chutzpah has not diminished even as we have recently become grandparents! She can still be seen ‘snorkelling’ in deep seas, surfing, rolling in snow and sands,” he says indulgently. 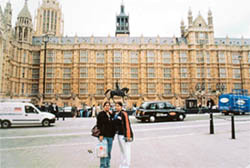 Ravinder and Chand, both of whom worked for top-notch American companies before handling the family business, say, “Smart bags (hung inside clothes) and pocket belts are the safest bet to carry all documents, passports, credit cards and wallets.” Chand advises on verifying your baggage boarding to the connecting flight on computer before boarding the flight. These establishments have been facing uncertain future since the last three decades of indecision by the state government. According to Mr Madan Lal, the partner of Amin Chand Sode Wala, the government had issued notification three times to take over the market for the beautification project, but somehow shopkeepers had managed to get the scheme de-notified every time. Narrating the sequence of events, Mr Madan Lal said that they first established the business in 1919 at the outer periphery of the Golden Temple but were displaced from this area in 1972 and they moved opposite the Ghanta Ghar on the land of the Improvement Trust which was given to them on lease. He said this was done on the intervention of the Punjab and Haryana High Court which came to their rescue and since then they had been running 48 shops in the market. The continuous dilly-dallying about government's plan of beautification of the area near the Golden Temple under the two final phases of the Galiara project had kept the market (that depended entirely on the devotees visiting the temple) on the tenterhooks. 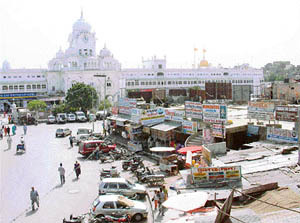 The new market built by the Improvement Trust in front of Harmandar Sahib after Operation Blue Star comes under the fourth and the fifth phases of the Galiara project under which the shops are likely to be acquired for the beautification plan. The shopkeepers alleged that the plan was unreasonable, as the area could easily be widened for beautification without taking the extreme step of "uprooting" them and demolishing their shops. Many shopkeepers, who have been here for years, said the removal of encroachments by shopkeepers and ensuring of systematic parking in the area which covered more than half the road at present, could easily make land available for the widening of the road without demolishing their shops. The project includes beautification of the main side of the Golden Temple, which includes the widening of the road leading to the temple, construction of an underground parking lot, besides the shifting of the Ghanta Ghar Market near Akhara Sangalwala. The scheme also includes the plantation of saplings and installation of fountains to attract more foreign tourists. Mr Nand Kumar, president of the Ghanta Ghar Shopkeepers' Union, said perhaps it was easy for government officials to demolish a structure or shift or rebuild it. But it took decades to earn goodwill in the market. Before this, the Improvement Trust had demolished shops in the Sodhian Bazaar for the Galiara project. Mr Nand Kumar said the shops had been allotted to them after the Supreme Court's orders in 1972. But in 1987 after Operation Blue Star, at least 16 shops in the market had come under the Galiara project. These shops were de-notified later as the market was made pursuant to the Supreme Court's orders. The union president said that in 1995, when a similar situation arose, the Ghanta Ghar Shopkeepers' Union had given representations to the Local Bodies Minister, the Deputy Commissioner, the Improvement Trust and the Galiara project in charge. The union demanded that all encroachments in the bazaar from Jallianwala Bagh to the Golden Temple be removed, which was certainly a better option to demolishing an entire market for a government project. The programme started with the presentation of the play Inqlab Zindabad directed by Pawandeep from Khalsa College Public School. Later, DAV International School presented another play Yeh Lakirain Kyon, which discussed Partition of the country. The students of Master Mani Ram Modern Senior Secondary School presented a play on the life of Madan Lal Dhingra. Later, director Narinder Sandhi presented a play titled Sikandar Ki Wapsi. THE Synchronise Sports Club, Amritsar, organised Inter-School Hoopla Tournament at Pioneer School, Fatehgarh Churian Road, recently. More than 200 players from 15 schools competed in the tournament. The winners in the competition included Ravnoor (Pioneer School), Harpreet (Sri Hemkund School), Ranjit (Angel Heart School). Nitika of Pioneer School stood first in the junior girls' category and Ravneet stood third among the senior girls. The overall team trophy was won by Sri Hemkunt Senior Study School, while the second position was bagged by Pioneer School. The third position in mixed-group (under-10) was won by Angel Heart School. "Along with appetiser sebh ka panna, there was masala apple juice. The non-vegetarian main course, with a dash of apples in sebh murgh Mughlai cooked in rich nut gravy, was yet another mouth-watering dish. Navratan apple korma and chatpatta sebh allo, sebh ki kheer and shahi sebh ki mohrien were other delectable fares at the festival," said one of the visitors. The festival to introduce apples in the mainstream food preparations was held at "Yellow Chilli" restaurant of the master chef Sanjeev Kapoor, in collaboration with the Washington Apples Commission (WAC) represented by agribusiness group SCS. Mr Sumit Saran, Indian representative, WAC, talking to The Tribune from Delhi, said the idea was to give Punjabis — the connoisseurs of cuisines —a taste of different flavours of apples. "Although the sweetness of the main course did not actually gel with many enthusiasts, the desserts and appetisers found a good number of takers," said Ms Mahima Kapoor, one of the owners of "Yellow Chilli" that has celebrated Hyderabadi and Thai festivals in the past.